BrakeBlog by Eric Brake is licensed under a Creative Commons Attribution-Noncommercial 3.0 United States License. Permissions beyond the scope of this license may be available at https://www.ericbrake.ws/copyright-statement/. When Greg K-H announced his new book I was intrigued that he was distributing a downloadable copy for free. Even impressed that O’Reilly was allowing it to happen. The book offers benefits for both the “Kernel god” hacker and the greenest “What is a kernel?” newcomer. For the advanced user, parts two and three contain the config recipes and kernel reference. Both of which offer fast reminders on performing certain tasks without digging through the complete kernel docs looking for the one detail needed. No one should complain that the book is too light-weight for advanced users because the book’s purpose was never to copy the kernel documentation word for word. Part One would be a greate help to anyone new to compiling their own custom kernel. Part one explains the neccessary components as well as the locations where they can be downloaded. The rest of part one describes the configure, build, install, boot, upgrade, and repeat cycle. For Gentoo users in particular, LKN offers a way to break using Genkernel as a crutch. When I switched to using Gentoo I didn’t know anything about compiling my own kernel. So in that way it allows new users to create working kernels even if it compiles every module known to man and beast. If genkernel all were level zero “OMG IM A N00B” then genkernel --menuconfig all would be “intermediate skills but still rides with training wheels on”. A tip to use while using the standard make commands is to make defconfig before “menuconfig”. Defconfig creates a sane config with default options chosen by the maintainer of that architecture. Beware though that the file still needs to be customized since there is a lot of hardware not enabled. Kernel 2.6.20 introduced a nice update for the ipw2200 driver. Previously the driver didn’t report power levels for wireless networks. 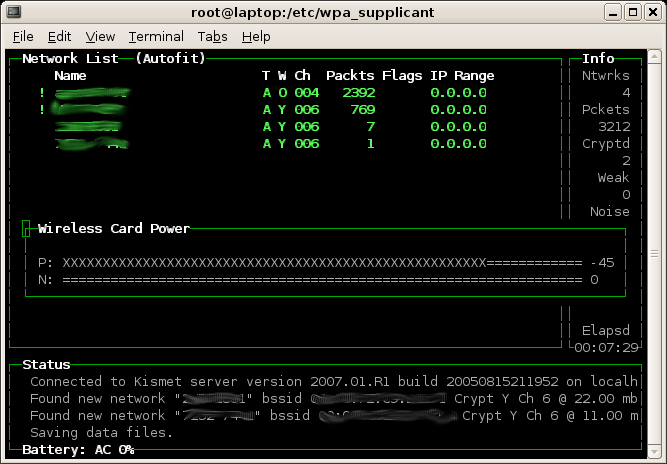 This would show up when sniffing with Kismet, while viewing detailed info about a network. Using the signal levels it’s possible to home-in on the access point’s location. 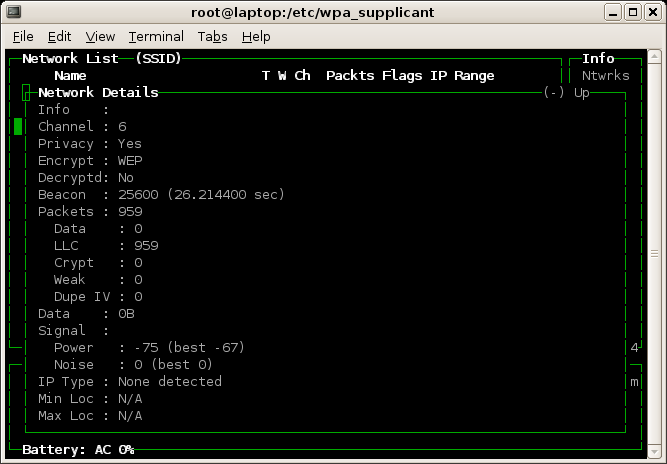 Sitting inside my house my connection with the home wap is about 44 decibels and the worst reading has been about 80 while sniffing distant networks. The signal reading also gives a clear indication whether it’s to worth it to attempt to connect. Documentation is often the most neglected part of a project because it’s easy to “just to do it” and jump to the next thing. It’ll come back to bite me though if I ever had to restore the laptop from scratch. So far I’ve got a seed started on describing the config of my laptop. I’m trying not to duplicate info found elsewhere. I’d rather link to more extensive documentation and use this page to document changes specific to my laptop. I’d also like to say the auto-thumbnailing function when I upload a image to WordPress is wonderful. I’m used to doing manually. I wish I switched from blogger a long time ago. New wordpress blog installed. This website has been dead for a year or more and I finally decided to start using it again. After all, I was paying for it to be idle. To prevent this website from going dead again using it for something useful might help. The previous blogger blog was only a place for rants and little else. On WordPress I want to document problems/issues and their solutions while using Gentoo Linux, my favorite distro. With the occassional rant obviously. :) After some time, I want this website to be where I search “how did I fix that?” when the same thing happens six months later. WordPress is a nice piece of software, thanks.